Helping Heart Families » Nicholas - Gavin's Got HeartGavin's Got Heart - Our mission is to spread congential heart defect (CHD) awareness while offering support to families with children affected by CHDs. Nicholas was born with dextrocardia, heterotaxy, pulmonary atresia, vsd and transposition of the great arteries. 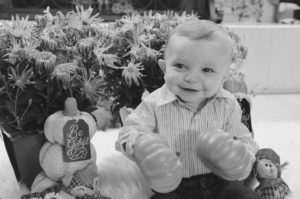 He underwent his first open heart surgery at 2 weeks old. While in recovery Nicholas went into cardiac arrest and was placed on ECMO (life support) for 3 days. With prayers our miracle made an amazing recovery and underwent his second open heart surgery 10 months later. Nicholas is now healing and doing all the things a 15 month old should! His cardiologist said he is doing so well that his next surgery could possibly be postponed until next year!